Jack stands are some of the most under-appreciated maintenance accessories on the market today. Put simply, if you have to lift your vehicle for any type of maintenance, they can save your life. Why? Because hydraulic car jacks can lose pressure, and other types of car jacks can fail in other ways. If you plan to work underneath a lifted vehicle, use jack stands. The good news is that in terms of the best jack stands, there are several choices available. They get great customer feedback and are affordable to boot. We have reviewed a wide range of price points, tonnage capacity, max heights and metal types. Here are our top picks for 2019. Construction: Steel. Locking Mechanism: Pin. Tonnage: 3 ton. Lift Range: 13.2 inches to 21.5 inches. Model #: 10498-PAIR. Why Buy? Rubber pad on saddle prevents scratches if your car’s lifting points are in difficult locations. Well constructed with a 3 ton capacity and pin type locking mechanisms. Luxury touches include rubber saddle and powder coating. Why is the ESCO our Best Premium set? ESCO’s 3 ton offering has some nice features not found on other products in our review. Most notably is the saddle. It is a large 4 inch disc with a thick rubber saddle cushion. According to ESCO, this protects the vehicle frame better than axle type saddles. The saddle pad will also not scratch paint if lifting points are located in challenging spots (e.g., side pinch welds). The height range is class leading, extending up to 21.5 inches. Finally, a nice high-end touch is that the base is powder coated to prevent rust. It is the only product in our review that is powder coated. As great as the ESCOs are, they are not perfect. Premium brand, but premium price as well. The ESCOs are a top notch set and are favored by drivers of high-end cars. Construction: Aluminum. Locking Mechanism: Pin. Tonnage: 3 ton. Lift Range: 10.7 inches to 15.6 inches. Model #: T43004. Why Buy? Great price for high grade aluminum jacks stands that get excellent customer feedback. Lightweight 3 ton jack stands with pin type locking mechanisms. Great looking and great reviews. Why is the Torin Big Red our Best Aluminum pick? The Big Reds provide the same 3 ton support capacity as our other picks but weigh 30% to 40% less. At 10 pounds each, they are very easy to maneuver, even when you’re positioned awkwardly beside a car. Made with a high grade, polished materials, the Big Reds look like industrial works of art. They will definitely make your fellow car junkies jealous. The pin locking mechanism makes the Torins both very sturdy and easy to adjust. Another nice touch is that they break down to a small size for easy storage. The Big Reds have a smaller foot print than A-frame models. This means they are less likely to damage garage floors. The downside is that if your floor isn’t perfectly flat or level, they tend to be less stable. Smaller base than A frame stands cause some people to worry about stability. We like the Torin Big Reds a lot. They may be our favorite overall. They come with a 1 year limited warranty. Construction: Steel. Locking Mechanism: Ratchet. Tonnage: 3 ton. Lift Range: 10.9 inches to 16.3 inches. Model #: 8523737812. Why Buy? 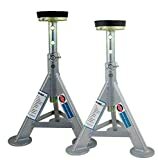 Solid quality jack stands that get great reviews for less than $30. Set of heavy duty, 3 ton jack stands with a double locking pawl and tooth design for extra protection. Why is the Cartman an exceptional value? The are just a very serviceable set of jack stands at a very affordable price point. Like most of the top competitors in this segment, they have a one piece ratchet bar and a quick adjustment lever. The Cartmans do not have any higher-end touches like rubber saddle pads, aircraft grade construction or a powder coated base. Their main selling points are solid reviews and an unbeatable price. While these offer solid construction, the craftsmanship is a level below higher end models (e.g., end welds). Construction: Steel. Locking Mechanism: Ratchet. Tonnage: 3 ton. Lift Range: 11 inches to 16.5 inches. Model #: T-6903D. Why Buy? 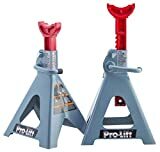 Another set of well reviewed jack stands for less than $30. Why is the Pro-Lift an exceptional value? 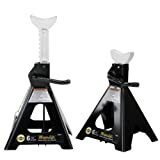 Purchasing a set of jack stands that gets good reviews for around $30 is a deal that is hard to beat. 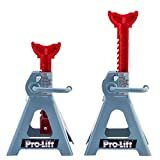 The Pro-Lifts are unique in that they have a double locking mechanism — the normal locking handle that ratchet stands have AND a pin as well. While this does provide added security, some people find it more difficult to lower the ratchet bar once the job is done. If any problems arise, customer service is excellent. This set of Pro-Lifts are our favorite budget options. Again, craftsmanship is a notch below higher end competitors. Construction: Steel. Locking Mechanism: Ratchet. Tonnage: 6 ton. Lift Range: 15.4 inches to 23.8 inches. Model #: T-6903D. Why Buy? 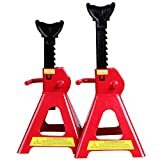 Solid heavy duty jack stands with excellent reach for a great price. A set of well constructed, high-grade steel 6 ton jack stands. Large saddle surface area. Classic style A frame ratchet jack stands with a traditional locking rack. The multi-position, forged iron ratchet bar features single piece construction. The design offers very precise height adjustments. A relatively large saddle helps ensure stability. It’s also lightweight and easy to maneuver especially given its tonnage capacity. The Torins meet ASME safety standards. Some reported quality control issues (e.g., bent supports) by a small % of customers. Comes with a limited 1 year warranty. Construction: Steel. Locking Mechanism: Ratchet. Tonnage: 6 ton. Lift Range: 15.8 inches to 24.4 inches. Model #: 32066. Why Buy? Has a gas spring that automatically elevates the ratchet bar to the vehicle. Set of sturdy heavy duty welded 6 ton jack stands with patented Magic Lift technology. The Omegas are like every other traditional ratchet style offers but for two exceptions. First, they have class leading reach with a maximum height of 24.4 inches. Secondly, their patented Magic Lift technology is an unusual premium feature. Just pull the lever and a gas spring automatically raises the ratchet arm. This is nice because you don’t have to guess at the height needed, unlike with a pin type. The Omegas are a very sturdy 34 pounds, which is 16% heavier than the Torins. The plus side is that they have a true premium look and feel. The Omega Magic Lifts come with a full 1 year warranty. Construction: Steel. Locking Mechanism: Ratchet. Tonnage: 6 ton. Lift Range: 15 inches to 23.5 inches. Model #: T-6906D. Why Buy? Very hard to find a good quality set of 6 ton stands for under $40. Sturdy heavy duty welded 6 ton jack stands with a dual locking mechanism at an unbeatable price. These are the big brothers to the 3 ton Pro-Lifts we reviewed earlier. They have the same double lock mechanism with a traditional locking handle and pin as an added safety measure. Reach is excellent at 23.5 inches and build quality is top notch for the price. The Pro-Lifts are very good deals for the money. Occasionally out of stock due to lower price. There are two reasons to use heavy duty jack stands. The first and obvious reason is that you’re lifting something very heavy, such as a Recreational Vehicle (RV). The second reason is psychological. For some people, if they’re putting their bodies at risk underneath a car, they want the best jack stand with the highest capacity. Even if the capacity ratings are overkill. It may not be rational, but I’m a bit sympathetic to this argument. Enter the OTC 1780’s and their awesome 22 ton weight capacity. Construction: Steel. Locking Mechanism: Pin. Capacity: 22ton. Lift Range: 12 inches to 20 inches. Model #: 1780. Why Buy? Super heavy duty construction and outstanding weight capacity ratings. If you can make use of them, the OTCs are just cool. They have large, almost 4 inch saddles coupled with an 8 inch base for better weight distribution and added stability. The OTCs are solid steel with no cast iron or other cheaper metals used anywhere. They tip the scales at a hefty 80 pounds and meet the most demanding U.S. certification standards. The pin style locking mechanism is extremely secure. The pin alone is 1 inch in diameter. The OTCs are much larger than they appear in pictures. “Photos don’t do them justice” is a common refrain from new customers. Most car enthusiasts are tool junkies. As you might expect, top shelf, heavy duty accessories like these get rave reviews. Even if you have a large SUV or truck, the OTCs provide way more capacity than you need. However, if you want added peace of mind and/or plan to purchase larger vehicles in the future, such as RVs, the OTCs may be just what you need. 3 inch increments on bar offers less gradation in height than traditional ratchet bars. A jack stand supports a vehicle once it has been lifted with a car jack. Car jacks of any type are not suitable to hold vehicles up for long periods of time. That is the sole purpose of a jack stand. They prevent lifted cars from falling. Unlike with car jacks, there aren’t many moving parts to break. As a result, these products are very strong, and some models can support in excess of 20 tons. Most jack stands are pyramid shaped, or sometimes called “A-shaped,” which you can see if you look at them from the side. The pyramid base houses a ratchet bar which is adjustable in terms of height. At the top of the ratchet bar is a “saddle.” The saddle is the part of the stand that comes into contact with the vehicle. See below for an illustration of a ratchet bar and saddle. By car tool standards, jack stands are straightforward in terms of construction. The only real variations are in the height adjustment mechanism and the type of metal used. In terms of height adjustment, there are two types: ratchet mechanisms and pin mechanisms. Ratchet style mechanisms have bars with teeth on one side (check illustration above). As you pull the bar upwards, the locking handle engages and holds the bar at a given height. Simply lift the locking handle and the ratchet bar will fall back to its starting point. Pin locking mechanisms are straightforward. As you can see in the photo below, simply set the bar at the level you need and insert the pin. In terms of metal used, most are made from steel. Some higher end models, like in the photo above, use aluminum. The type of metal mainly affects weight and ease of use. All are clearly labeled in terms of how much weight they can support regardless of their underlying construction material. The National Highway Traffic Safety Administration estimates that 8,000 Americans are injured in jack related, but non-tire, accidents and 2,000 in tire-related jack incidents. Clearly, it is very important to know how to operate a set of vehicle jacks safely. One thing that makes the process MUCH safer is using jack stands. It probably goes without saying but you need to know how to use a car jack before even worrying about jack stands. Check the weight capacity of your jack and stands to make sure they exceed the weight of your vehicle. Make sure your car or SUV is on a solid AND level surface. Do not attempt to lift the vehicle if it is parked on dirt or other soft ground. Check to ensure the vehicle is in ‘Park‘ and engage the emergency brake. Set wheel chocks underneath the tires not being lifted to prevent accidental movement. Lift the car by placing the jack underneath the appropriate lifting points (refer to owner’s manual) and pumping the lifting handle. Locate the points to safely place the jack saddle. Usually these will be the main frame, bulk head or pinch welds of the vehicle. Adjust the jack stands to the appropriate height and position them according to Step 1. Note: the rule is one jack stand per elevated tire. Gently lower the vehicle until it settles on the jack stand saddles. With a hydraulic jack, twist the release valve and the jack will slowly begin to lower until the jack stands are fully supporting the weight of the vehicle. Standing away from the vehicle, just gently nudge the side of the car to make sure it is securely settled on the jack saddle. At this point your car should be safely elevated and you can perform whatever maintenance is needed. For those of you that are visually inclined, check out this extensive video on safe usage. For an illustrated guide, check here. These concepts are embedded in the process above, but it is worth keeping them top of mind. Car jacks are not meant for supporting weight long term. If you need to lift your car for more than a few minutes, use jack stands. They have higher weight capacities on average and have almost no moving parts to break. Do NOT, under virtually any circumstances, crawl underneath a lifted car unless there are jack stands properly installed. Vehicle jacks break and/or slip all the time. Use only lift points that will firmly hold you car and not cause any damage. For example, never place either a jack or jack stands on the lifting plate of the engine or transmission. Match the number of jack stands used to the number of wheels lifted. If you lift the entire rear of the car, be sure and use TWO not ONE. Practice a bit of overkill on weight capacities. If you have a 5,000 pound SUV, use 3 ton jack stands at a minimum. Lastly, at the risk of sounding like your mother, always check the instructions. Jack stands are relatively uniform, but there could be brand-specific nuances that prove to be critical. Weight Capacity. Jack stands are available in tonnage capacities ranging from 2 tons all the way up to a top rating of 20+ tons. For most compact and midsize passenger automobiles, 2 tons should be fine. For large cars, SUVs, half ton pickup trucks, 3 ton jack stands would be advisable. The rule is that the jack stand capacity should exceed the curb weight of your vehicles PLUS any added cargo. Height Range. Most car jacks do not exceed 20 inches when fully elevated. A few low profile floor jacks will go up to 24 inches, but those are exceptions. You need to match the lift range of your jack stands to your car and car jack. If you have a low profile sports cars, you need short jack stands. For cars and SUVs with normal profiles, jack stands of 22 to 24 inches should be fine. Material. As we noted earlier, most jack stands are made out of either steel or aluminum. Steel is by far the most common of the two. Generally, this is a tradeoff between price and weight / ease of use. Aluminum jack stands are lighter and easier to move around. However, they can cost 50% to 100% more than their galvanized counterparts. Height Adjustment Mechanism. As we noted earlier, the two primary adjustment mechanisms are ratchet style or pin style. Ratchet style products are far more common. They are easy to use and allow for a finer gradation in terms of height adjustment. Pin style models are considered more durable as there are no teeth or other weak points to break. Saddle. The primary concern with the saddle is whether or not it is large enough to securely hold a car so there is no slippage. Some newer jack stands have a rubber padded saddle. The foam rubber protects car paint from scratches, especially when using jack stands on the side of vehicles. Do not ever work underneath a lifted vehicle until you know it is well supported and secure. This means supported by jack stands and NOT a car jack. The good news is that there are many great jack stands available at very affordable prices. Because they are simple products with few moving parts, there are dozens on offer that get excellent reviews. As far as using jack stands goes, the rationale is pretty simple. They don’t cost very much AND they can literally save your life. In terms of a wining value proposition, that’s about as good as it gets. Yes, all the ones we reviewed come as a set. The ESCO 10499 Low Profile Performance Jack Stand that we did not review but mentioned as a good option for those with low profile sports cars is the only one sold as an individual stand. What are the most important safety considerations? We covered this in our review, but it bears repeating. Do NOT put your body underneath a lifted car if it is only being supported by a car jack. Use one jack stand for every wheel that is being lifted. Check to make sure your stands have a sufficient weight capacity rating. Only place your stands on manufacturer approved lifting points. Are aluminum jack stands better? There is not a performance difference in terms of holding capacity. If a jack stand is rated at 3 tons, it’s 3 tons regardless of what metal is used. The only tradeoff is cost and ease of use. Aluminum is lighter and easier to move around. But, it costs more. In the end, it becomes a matter of personal preference and budget. Are jack stands sufficient to hold up cars? Yes, assuming the right weight rating and proper usage, they are sufficient to hold up cars. That said, some people add extra support before crawling underneath a lifted car. For example, if tires are removed, sometimes they are also placed underneath cars as an added element of protection. If you do this, be sure that whatever you add does not in any way interfere with correct installation and operation of your jack stands. What range do you recommend? Before ordering, you should measure the distance from your car’s lift points to the ground. Most car hydraulic jacks have a maximum lift range of 16 to 20 inches. A few models go up to 24 inches. As you will notice, most of our 3 ton jack stands have a max height of ~16 inches and the 6 ton models ~24 inches. Know your vehicles’s profile and the max lift of your car jack, and check to make sure any jack stand that you buy matches. Bent or crooked ratchet bars. What are the safety standards that must be met? The most common language you will see is “meets ASME safety standards.” ASME stands for the American Society of Mechanical Engineers. They are usually referring to the ASME Portable Automotive Service Equipment 2014 guidelines. Always check to make sure anything you purchase meets these top guidelines. Are any of these made in the U.S.A.? All of the top brands are manufactured in Asia. Hein-Werner used to be made in the U.S.A. After some ownership changes, Hein-Werner now has some parts from and assembly in the U.S.A. However, Hein-Werner tools are still considered to be made in Asia by most people. Are there any integrated models available? Only a few. Usually the combination is a hydraulic bottle jack and a jack stand. This combo is not that common because most of the time people need multiple jack stands. Powerbuilt makes a 2 ton model that has been moderately well received by customers. Is is worth it to spend extra money for the best car jack stands? Clearly this is just a matter of opinion. For us, the answer is yes. We prefer both premium models and a little bit of overkill in terms of weight capacities. For example, if I had a 4,000 pound vehicle, I would use 3 ton jack stands versus 2 ton or lower rated capacities. As always, the best argument for spending a few extra dollars for top quality is that the best jack stands can save your life.